The city of London has a fascinating history, but for the filmmaker and photographer, Richard Miller, there is one place that holds a particular interest for him. Bermondsey Street. Bermondsey is a district in Southwark that Miller moved to in 1988. As the years went by, he saw how the area was changing, and decided to capture this evolution by taking photographs. 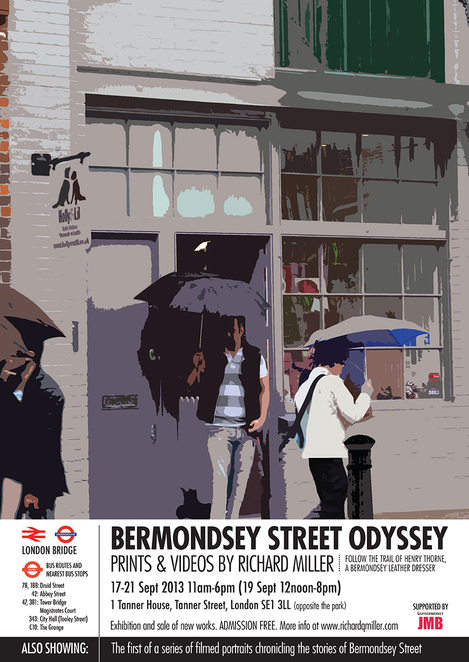 Then in 2011, Miller came across an old photo from 1880 that showed a scene of everyday life on Bermondsey Street, and decided that he wanted to do an exhibition covering the place's history. Between the 17th-21st September, The Bermondsey Street Odyssey will be freely open to visitors at Tanner House. The exhibit will include Miller's prints from 2012-13, videos of the area from 1988-89, and provide a historical background that covers the last two hundred years. Special features will include a personal history of Henry Thorne, a leather tanner from Somerset, who set up shop on Bermondsey Street in the 1852. There will also be screenings of #55, a film by Amy Ryles and Jude Bliss.